I have come to realize that my life operates beyond the idea of what I think I should be doing or any plans I make to be fruitful or productive. Even when I think of myself as slacking off, the meaning or growth I apparently need is presented to me effortlessly. It is the acceptance of this effortlessness that is a profound challenge, especially when I’ve spent so much of my life literally laboring under the assumption that I need to do more, work harder, be the functional self that defines my life as worthwhile. The last 6 months have been challenging ones for me, as some of my blog posts have described, and in late January, I decided I needed a break in the evenings, beyond the occasional episode of NOVA or Nature. So I began what my daughter-in-law would call “binge watching” all seven seasons of The West Wing on Netflix. I’m now in the middle of season 6. I just had a feeling that I should watch the whole series from start to finish. I didn’t know what was going to happen if I did that, but I decided to trust the hunch. From the time I saw the film The American President, I’ve always been a fan of Aaron Sorkin’s writing and vision. I truly enjoy watching shows that are well written, and I guess in some way I am a public policy nerd in love with the romance of the White House. As I told a neighbor, the show has nothing to do with my life, and everything to do with my life, and it’s this paradox that makes it perfect. As I watch a few episodes each evening, I am returned to the start of the 21st century when the show was on. I would watch it warming up in front of the newly finished masonry stove after coming home from a chilly evening in the tented outdoor arena where my therapeutic horseback riding classes took place. I remember feeling disturbed when it was written into the show that President Bartlet had MS, but had kept it from the public. First of all, I was personally opposed to keeping it a secret, although I know many people with MS do just that, and for good reason. I may even have stopped watching it regularly because of it. But as I’ve gone through watching several seasons of the whole series, I realize that I probably watched more of it than I remember watching before I gave up our basic cable service, but that I felt very uncomfortable about whether they were handling the reality of MS accurately. In fact I certainly did stop our TV service before that reality unfolded as clearly as it has in this next to last season. I don’t remember ever seeing the one I watched the particular evening I ended up sitting down to draft this post. It brought a powerful memory to mind and tears to my eyes in the best kind of way. In this episode called “In the Room,” President Bartlet and his staff are preparing for a trade summit in China. The camera shows the viewers that President Bartlett is having trouble using his hands which his senior staff don’t see. (The worsening of his symptoms has also been shown in this same manner in more subtle ways in previous episodes, all incidents I could relate to.) Once they get on Air Force One, he has a full blown exacerbation, and can’t move his legs or arms. Yet he insists on continuing to China for the summit instead of turning the plane around. When they get to China, the Chinese are unable to locate a working hydraulic lift that would take him in his wheelchair from the plane to the ground (my goodness I can relate to these kinds of delays too). After waiting over an hour, while everyone is arguing about what comes next, he calls his burly new personal assistant over and asks him if he thinks he can lift him. Before anyone has a chance to see what they are doing, Curtis is carrying him off the plane. As Martin Sheen put his arms around the neck of the actor playing his young aid, I was viscerally transported back to the year after I was diagnosed. Mike was in the sixth grade at Russell Elementary School and open house was approaching. He really wanted me to come and see his classroom. Russell is an old brick school building and the sixth grade classrooms are up two flights of stairs. Since I could not get up and down the stairs, and there was no working elevator, we had a problem on our hands. But I was determined to go. A dear friend offered her husband, who was a big guy like Curtis in The West Wing, and her dear friend also offered her husband, a strong young man at the time. Together, they made me a seat with their arms–a fireman’s hold, they called it. It would feel more stable for me than one person carrying me and I could look straight ahead to help counteract any vertigo I might experience. I put one arm around each of their necks and they carried me up the steps to Mike’s classroom. It was a triumphant and joyful night. First of all, I had to let go of my childhood idea that I was still a fat little girl that was too heavy for anyone to lift. Second of all, it was freeing not to worry what other people thought, and just to be happy that I could be there to see what my son wanted me to see. And third of all, it was so wonderful to have friends who would literally lift me up so I could get there. Even in my wish to escape and relax these winter nights by watching this whole series, I discover I am picking up a dropped thread of my life and weaving it back in again. I am discovering that perhaps I stopped watching too soon, that if I had been able or willing to keep watching I would have seen President Bartlett exhibit the strength it takes to let other people help you so you can get where you want to go, something that would have validated my own challenging experiences at the time. But perhaps the timing is also perfect. Now, at this time, I have a much more profound acceptance of where I’ve been, because of the gift given to me to improve where I am headed. And experiences like this remind me it is all very real, both the symptoms and their softening–or hardening–if I take on too much and don’t rest enough, or if I were to stop eating as I now eat. Although I did not experience the kind of intermittent paralysis or the off and on optic neuritis dramatized in the episode, I have never lived the schedule or continual stress any leader of the free world ives either, fictionalized or real. My own difficulties with using my limbs were more those of weakness, of them just seeming to “go away” in terms of strength or presence, or getting them to do anything I wanted them to do. Sometimes, I could go through the motions of trying to scrub the bathtub, for instance. But I had to admit to myself that they were indeed just motions and that I did not have the strength in my arm to clean anything off of anything. When I tried to climb stairs my legs would buckle under me. Sometimes instead of being able to grasp a coffee mug, I would unintentionally end up sending it sailing across the counter. I could barely hold the phone to my ear, and after a while that became too hard. So did holding my head up for long periods of time. The character of President Bartlett describes this “departure” of function very eloquently in terms of his problems with balance. To paraphrase the lines of his character admitting this to his senior staff: “It’s just gone. I don’t know where it went, or when it will come back. I feel it when it’s here, and when it isn’t I don’t know where to find it.” Yes, exactly. He also has to pay dearly for that with exhaustion afterward, and they don’t shy away from letting viewers realize that either. There’s even talk in the next episode about how he needs to take a nap in the afternoon, have rest periods from continual stress, and the difficult rock-and-a-hard place between doing and overdoing anything from reading to standing to being too hot or shaking hands or signing one’s name over and over–something I had to meet with an occupational therapist about when I was diagnosed and my first book of poetry was coming out that same month. She taught me a strategy for supporting my whole arm on the table so, along with a soft support brace wrapped around my hand to strengthen it, I could do my best to make it through signing books in the foyer of the University of Idaho Law School Courtroom after my English Department reading was over. Tonight as I sit at my desk drafting this post, I realize I am staring at an art project that Mike did in that same 6th grade classroom I was carried up in a “fireman’s hold” to see. 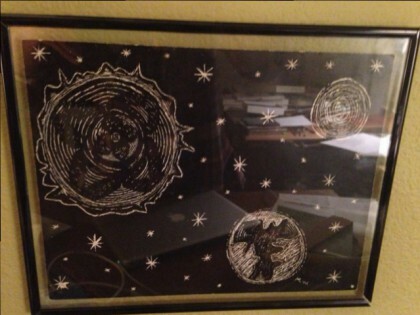 It’s photographed at the top of this post: an etching of white on a cardboard surface inked with black, of stars, suns and planets. Mike called it “Spaceballs.” It’s absolutely delightful, and I’ve kept it all these years both because I just love it, and also because on the back side of it, the teacher he butted heads with all year long has written in pencil “A/A- Date Your Work! !” It’s such a hilarious testament to her sour side that she couldn’t think of anything nice to say, that she would actually give him half an A- for not putting a date on it, and that Mike was pulling her leg about the assignment by naming it after a Rick Moranis movie, something she most likely did not catch at all. I framed it in a clear floating frame so I can still take it off the wall and turn it over to read when I want to laugh about what makes my son so quintessentially himself, and remember the ensuing detente between him and Mrs. X that went on all year long. And yet, even if his teacher drove him crazy so he drove her crazy, he wanted me in that classroom for open house night. He wasn’t ashamed I couldn’t get up the steps myself, he just wanted me there. These memories are another reminder of all I’ve lived through, how far I’ve come, and why it’s still good to rest, why I still need to when I need to, and that it’s all true, missing medical records and unseeing neurologists notwithstanding. That even when I think I’m slacking off by watching old TV episodes on my lap top, my life finds a way of giving me a sense of profound continuity and validation, slow miracles still unfolding, both then and now. Life always gives me what I need, perfectly, sometimes in spite of my own best efforts to avoid it, or precisely because I make no effort to find it. I don’t always need to know where I’m going or have answers about how to proceed. I can even spend time doing things that are the equivalent of staring into space–or “space balls”–and it’s never wasted time. Often, as happened with President Bartlett, being “in the room” is not a matter of strategy, but a serendipitous gift. The West Wing episodes also give a broader perspective on this serendipity–that it’s not just personal, but that such seemingly “happy accidents” drive major discoveries in science. If there’s a policy debate scripted into the show about funding billions of dollars to further separate an electron, or whether NASA should send a manned ship to Mars, the usual derision that it’s a waste of time and money always starts out the conversation. But then the writers of the show have a way of sneaking in that most major scientific discoveries have occurred and do occur “accidentally”–like penicillin, for instance–while scientists were busy looking for something else they thought was important to find. Thus, seeming to waste time is often not a waste of time at all. It can open up free space for new thoughts, experiences, insights and discoveries, both about oneself and the world at large. It puts me back “in the room” in a whole new way each time it happens, in awe at the invisible workings of my world. What a great story, thank you, I think I will watch westwing. I used to watch in years ago and its on Netfilx so I think I will. I hope you are doing great. Its a great picture. Final note–I went through some challenging health problems of my own about 10 years ago (though they weren’t as rough as MS), and while I participated as a volunteer and not a rider, I credit working with a therapeutic riding program as part of my recovery. The kind people, the companionship with horses, the chance to help other people have fun and feel better–nothing could be more healing! Hi Lee, thanks for the solidarity on binge watching. 🙂 I’m glad you also enjoyed the memory that came up in the process. Fascinating to learn that both your parents worked on the Hill. And oh, I am SO happy to learn of your involvement with therapeutic riding! The volunteers I worked with were fine people, and some became good friends. They gave me rides to class, helped me through an accident with a spooked horse, helped me shop for riding boots, and one woman became a friend who helped me clean my house for over ten years following. I bet you were a fantastic volunteer and I’m so glad to hear your involvement helped with your own recovery. It’s really an amazing experience from any angle. Thanks for sharing that! Your post also reminded me of when I was in Seattle and volunteered at a therapeutic riding center – it was started by a woman with MS who found the horses helped her a lot. And I fondly remember all the horses I worked with, I still miss them every day. Thanks for yet another beautiful story! For some reason I was especially struck by the visual I had of you originally watching the show after a chilly session of horseback riding, while warming up in front of your masonry stove. Inspiration comes at any time, and yes, when we’re ‘wasting time’, that’s sometimes the only time our brains are operating on what could be phrased as low power mode, haha. But then, when inspiration appears we have to be clever enough to seize it. Thanks for seizing it and writing a new blog post. Danielle, thank you so much for this wonderful comment. I am moved that the image of me warming up by the stove while watching the show after those chilly nights of horseback riding made an impression on you. I really appreciate knowing that. And yes, I so agree seeming “low power” mode is often the most likely way our brains can let knew inspiration into awareness! Here’s to seizing it whenever we can. I love this post in part because I’m also a huge West Wing fan (I’ve binged watched the whole show at least 2-3 times), and also because I think it’s interesting and admirable that you were able to give the show enough time to see your initial reaction to the writers’ handling of Barlet’s MS in a new light. I’m glad that things struck you in a different way upon consideration — and I agree that the message of learning to rely on others is important (important for everyone, not just important in the context of a chronic illness). I also really love what you say about recognizing the value of time that seems, at least on first inspection, non-productive or non-functional. I struggle enormously to create pockets of what I might describe as “non-structured” time in my life — in spite of the fact that therapy and Steven are helping to push me in that direction. When I am able to give myself just a little more free space, I am struck by how much I learn. I think that what we might call “idleness” or “quiet time” is as vital as the moments of action in our lives, because it allows us to absorb and process experience in very important ways. As always, great food for thought, Maria! Gena, so happy to hear you are a West Wing fan as well, and a partner in binge watching it, to boot! 🙂 Thanks for all you say about my process of watching it “then” and “now” as it relates to the show’s handling of MS–still so much to think about, still mulling it all over.